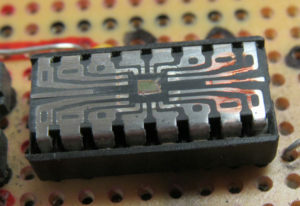 What’s inside an integrated chip? I damaged a CD4093BE and instead of throwing it away I decided to satisfy my curiosity regarding its guts. 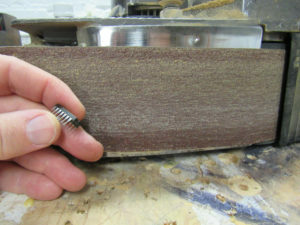 I used Omaha Maker Group’s belt sander to grind away the top layer of material and it revealed a tiny chip embedded within. The slightly orangey color on the right side is where I sanded away a little too much of the tin protecting the copper legs. 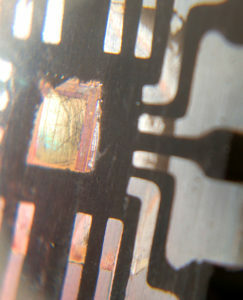 In the closeup view, you can just make out where filamentous wires must connect the legs to the chip. This entry was posted in Uncategorized by Patrick Bartmess. Bookmark the permalink.